At Inspire Physical Therapy and Wellness, we take a Pilates-Based approach to Physical Therapy. We were founded by a Board Certified Orthopedic Clinical Specialist (OCS) who uses a variety of tools to improve clinical outcomes including: manual therapy, soft tissue mobilization, Graston Technique, Kinesiotaping, therapeutic exercise, functional training and Dynamic Neuromuscular Stabilization (DNS) in conjunction with Pilates-based rehabilitation. Pilates-based physical therapy is a holistic and Whole Body approach to physical rehabilitation. It is a one-on-one, hour long treatment session with your physical therapist who is certified in the Pilates Method. 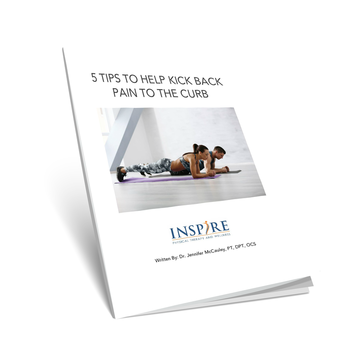 Learn The Top 5 Things To Help Relieve Back Pain.